Do you have stained teeth that harm the appearance of your smile? Are your ivories sensitive, making it difficult to endure teeth whitening? If so, then your dentist in Mount Pleasant is weighing in to explain how you can enjoy the confidence of a brilliant smile, without the discomfort of sensitive teeth. Continue reading to learn more about the benefits of professional teeth whitening. Is an Over-the-Counter (OTC) Whitener Good Enough? These days, you can buy more and more things OTC, which is very convenient for consumers. Still, availability doesn’t supersede effectiveness. An example is with OTC teeth whiteners. They are very convenient, but they lack in several areas when compared to the professional take-home option. If you have sensitive teeth, OTC whiteners will probably cause you some discomfort. This is because they aren’t custom-made to fit your mouth, like the kind you’ll get from your dentist. You can also expect to have less drastic results with OTC whiteners than with the professional strength bleaching agents offered by your local professional. Weaker bleaching agents also mean that you can expect a longer time before you’ll see any results from the store-bought alternative. Why is Professional Whitening the Best Choice? It provides you with a safer and more comfortable treatment process. So even though you have sensitive teeth, you’ll be able to experience the euphoria of having a bright smile. Your results will be drastic, and in some cases, your teeth can brighten by as much as eight shades. 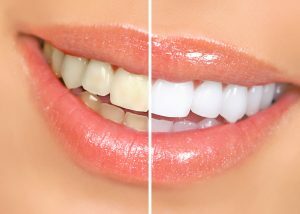 By using professional-strength bleaching agents, the time you need to whiten your teeth will be far less. A final advantage of using professional-strength whiteners is that you’ll still be able to wear your trays in the comfort of your own home. Thus, you’ll have the best of both worlds: convenience and a highly-effective and safe product. Does the Appearance of My Teeth Really Matter? When researchers polled people as part of a recent study, they found that 73 percent of those surveyed said they’d be more likely to trust a person with a nice smile more so than someone with a powerful job, nice car or flashy clothes. Then another study found that one-third of the new people you encounter will notice the condition of your teeth before anything else. Thus, if you want to make the best first impression possible, it helps to have beautiful, bright teeth. To learn more about how to achieve a dream smile with safe, effective and comfortable teeth-whitening, reach out to your dentist today! A 1981 graduate of Baylor College of Dentistry, Dr. Robert C. Sikes has nearly four decades of experience as a dentist. Still, he strives to expand his knowledge by taking continuing education hours annually. You can find out more about how Dr. Sikes helps his patients get the smile of their dreams by visiting his website.